Dorothy Leyton was born in Kenosha, Wisconsin, in 1903. She spent most of her childhood in Mexico but as a young woman she moved back to America where she became an actress. She appeared in several screen and stage productions under the name of Drue Leyton. 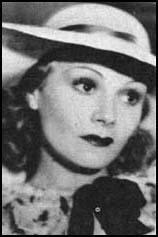 In 1938 she married Jacques Tartiére who was a French liaison officer with the British Army. She moved to Paris and worked for a French radio station. After the French surrendered to Germany in 1940, her husband left the country to join General Charles De Gaulle in England. Jacques Tartiére was killed while fighting for the Free French forces in Syria. Dorothy could have returned to the United States but decided to stay and work for the French Resistance. She moved to Barbizon where she purchased a small farm. Over the next few years the farm was used to hide members of the resistance and soldiers and aircrew trying to get back to Britain.